My Easy Peasy Wrap has a new home. 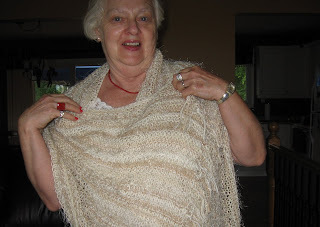 Dad's Dorothy - a lover of all things hand-knit or crocheted - cast a coveting eye towards 'The Wrap'. Well, not until after I asked what colour she might like if I were to knit one for her. "I like the colour of that one," she said. So my Wrap has a new home. Dorothy and Dad are taking the train to Quebec City for a few days later in the summer. Mentally, at least, Dorothy's bags are now packed. Everything in the suitcase matches 'The Wrap'. She plans to wrap in 'The Wrap' for fancy dinners and evening strolls on the boardwalk. It's such fun to give away a finished object to someone so obviously appreciative. Check out her crocheted top. Someone at 'The Bay' made that one for her. Hee Hee. That title will get me some interesting spam comments, I'm sure. because my high speed is connected once more. Mind you, I had to call and ask when I might expect the repair to be done. 5 minutes on hold and the Tecky told me that Bell had done something at their end and things should be working. Happy Happy. I think there is some economic theory that states "what starts as nice-to-have becomes need-to-have very quickly. True for me with high speed, that's for sure. And this too is making me happy. Three men in my front yard. Fred, the contractor and the cement guy. 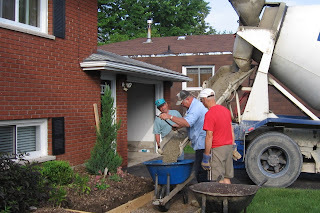 Pouring our new front sidewalk. 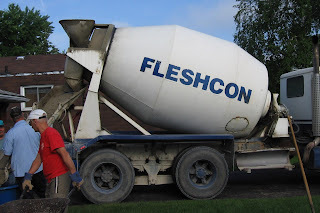 The contractor ordered the cement,and I am intrigued by the company name. Body parts in my sidewalk? Hee Hee. That's a joke I didn't tell the guys. I'm not that blonde. The name is from the town Flesherton. Home to the concrete company. And oh yah. Knitting. Here is the front of the summer top re-do. Getting there. Think Canada Day. Happy. Happy. Happy. Knitting's getting done. High speed is back. Does it get any better? If you’ve been reading, you know my luck of late. So guess what got left at home when I went to Knit Group today? No, I did remember my knitting. But that’s a good guess, as it is something I might do. My camera! But since I am still on dial up – no word from the good (Wink Wink) folks at Bell yet as to when they will come and look at the lines - it is painstakingly s-l-o-o-o-w to download pictures. So maybe it is just as well the camera got left at home. At Knit Group, young Sandy was patiently waiting for me when I arrived. Last week, I had been helping her knit mittens and I took her pattern home with me! She hasn’t been able to knit all week! I am sure she was pretty upset, but being a knitter, she just smiled. Nell was knitting doll clothes. Nell knits exclusively for her favourite mission, Someone gave her lots of old dolls – naked old dolls (No that is not Knit Group members on retreat!!) Nell is knitting clothes for them all so some lucky child can love them ‘second-time-around’. Pat was knitting socks for a grandchild and Sandy, our host Sandy, was knitting her ‘forever’ scarf. Although Sandy doesn’t really have time to knit at Knit Group these days, as she is hosting the group. She is much too busy making tea and coffee and ‘serving’ us. Aren’t we spoiled? Sandy is hosting us as we have been kicked out of the library for the summer. Cost saving measures mean the local library is closed about 3 days of the week this summer. One of those days being Knit Group day. The nerve, I say. If truth be told, we have been kicked out of every meeting spot so far. First the coffee shop who said we used too many tables, stayed too long and didn't buy enough. Kicked Out! Next another coffee shop that closes for the winter and now the library. Hmmm. What is it about knitters? My summer top re-do is coming along. I have about 6 inches of the front done. If I take a patience pill, I will post pictures tomorrow. Thursdays Are For Knit Group. And that can make any day, a better day. Good Thing # 1 - I got my car back today. It's nice to be a two-car family again, but the bill was astronomical! Who knew tires were so expensive? 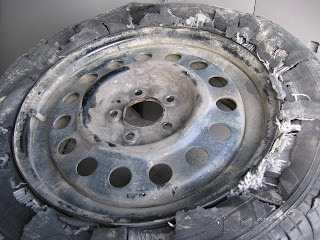 The tires that came with the van - although when they blow at 57000 K, I'm not sure I'd recommend them - were Goodyear. The garage man (we know each other so well, now, that he calls and says " Hi Brenda. It's Gary" - and I know immediately, it's 'that' Gary.) - said if I chose 'no-name', it would be cheaper. Let me tell you, cheaper is a relative term. The tire, the rim, a little labour and there went the better part of $400. Think in terms of yarn people. That's one 'honkin' tote of yarn. Yarn that obviously, Brenda will be riding on- not knitting. It's a good thing I had a major yarn crawl in B.C. this spring. Good Thing #2 Speaking of B.C. 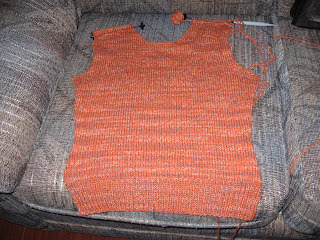 yarn, look how well the little summer top 're-do' is coming along. It's a quick knit, so if I push it - although with my luck of late, pushing might have dire consequences - I might be wearing this on Canada Day. Good Thing - I think - #3 My neighbour Sue told me that our mutual neighbour Paul wanted to convert to high speed internet service. Somehow, Bell &%#*@ up the lines and now Paul has NO computer service. Hmmmm. Think I'll call Paul. Maybe I didn't need the new modem after all. In fact, maybe the problem isn't at my house at all. I'm going to knit now. Let me introduce you to my life these last few days. Trouble Number One: Our trailer has sprung a leak. Just in case you ever decide to own a trailer, know this: If you open the door of the trailer for the first time in the spring and immediately start to retch because of the smell, you have a leak. Wet carpet. Closed trailer. You get the idea. Despite climbing on the roof and under the trailer, we couldn't find the leak. We looked on dry days. We - well, Fred - donned rain gear and looked on wet days. No luck. In the end, we came home and left it leaking. And worrying me – a lot. Trouble Number Two: Saturday, I decided to hike. It was a ‘car-shuffle’ hike. My car was left at the end point while I rode with others to the start point. . Once the hike was finished, I drove the drivers back to the little gravel side road in the woods to get their cars. They headed one way, I, the other. A few seconds later, I heard a thump, then a whooshing sound for a few seconds. When the sound stopped, the road became very bumpy. “Boy, do they need to grade this road.” is what went through my head. Even when I reached pavement – about 3 Ks later – for any of you that know about these ‘Don’t drive on flat tire things’, it was still bumpy. Slow learner, me, the light finally went on. I pulled over and looked. Boy! That tire was in shreds. It had blown. And the rim didn’t look too good either. (Such fun - a little walk after a three hour hike) to use the phone and call Fred. Once he arrived, the two of us attempted to change the tire. Finally, we gave up, put Fred’s spare tire on my car and drove home. All of which made me late for the most important part of my day. An afternoon of knitting and dessert at a friend’s house, to meet her knitting friend from Nova Scotia. And no, I didn’t take my camera there either. Trouble Number Three: Sunday night, my modem failed. I have had high speed internet for a couple of years now and in my opinion - but I’m no Tecky - I have needed a new modem from day one. The Teckies at the help desk must think I’m a stalker, I have called so often. Being just the customer (Do they treat all customers as retarded two year olds?) I couldn’t convince them the modem should be replaced. But last night the modem was dead. Two –not four lights. Dead. I called. Twenty minutes on hold and my portable phone died. Two dead technological wonders. I set the phone to charge and the alarm for 7 am. The early bird gets the worm sort of thinking. That was a good idea. Except, once I convinced the Tecky I needed a modem, he told me to call back after 8:30 when the sales department would be open. Apparently the Tecky can say “Yes the modem is dead.” But he can’t say “Yes, we will send you a new modem.” He was kind enough, though, to program my computer for dial-up so I could post my blog while I wait for the new modem to come. Trouble Number Four: While I waited for 8:30 to roll around, I decided to start a batch of bread. While shopping last week, I had purchased - at breath taking cost - a ten pound bag of Organic Red Fife Heritage Flour. “Won’t that make great bread?” I thought. My recipe starts with one cup of water. Ten minutes later you add an additional two cups. I have a one cup measure and a four cup measure. I got the one cup right, but still aggravated about my dead modem, I filled the four cup measure to the top and dumped it in. “Mmmmmm Must be really humid today” I thought. Trouble Number Five: With the bread finally set to rise, I decided to check my emails. I tried to dial up but the system told me it had no dial tone. Done. Still no dial tone. Check the phone. No dial tone. Check the bedroom phone. No dial tone. Check the basement phone. No dial tone. Check the neighbour’s phone. Dial tone. Mmmmmm. I called the 611 number to India. The rep set me up with a repair appointment tomorrow; I’m impressed with the service, until I’m told that if the problem is inside the house, there will be a $79.50 charge. Since our neighbour’s phone works, I’m pretty sure our problem is inside the house. I gasped, which cued the rep to try and sell me a ‘protection plan’. Cost? $96 per year. But if I signed up today, I wouldn’t have to pay the $79.50 tomorrow. Since I’m pretty sure I’ll be in the loony bin by tomorrow, they won’t be able to get money from me anyway. I declined. Trouble Number Six: I told Fred that Bell was coming tomorrow and would want to get at the box where the line comes into the house. That would be the box that Fred ‘boxed’ over when he re-did the laundry room. When he finished sawing, he came to the den to try and ‘fix’ the phone himself. This did help, as we at least determined that the computer was the problem, not the phone. I called India again. Repair appointment canceled. $79.50 saved. Trouble Number ?? I’ve lost count. I called the computer Tecky again. ”Why do I have no dial tone when I plug the phone line into the computer? I asked. He told me I had plugged the phone line into the wrong spot on the back of the computer. I told him it was the only spot available. He asked many, many questions. None of them related to my IQ. Nice Tecky. Then he mildly asked, if there might be another spot to plug in the line at the very bottom of the computer. OMIGOSH!!! Who would ever think to look way down there? My wrap was a hit, yesterday, at Knit Group. 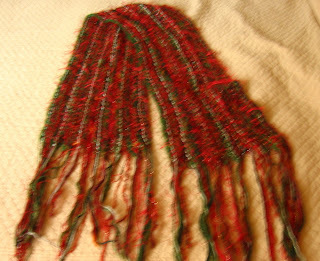 The first wrap I made, a Christmasy one, was a hit too when I wore it for last year's Knit Group Christmas party. Check out the 12 inch fringe. It's the type of wardrobe item that gives the everyday black turtleneck great 'WOW' factor. And things like that can make for a much less stressful Christmas season. It will be embarrassing when they discover how simple, easy and quick they are to do. So far, I think I have them fooled into thinking that something so gorgeous must be hard to do. Which of course is a great trick for any knitter to know. And I'm not saying they aren't creative. They are. And I'm not saying they're not beautiful. They are. But dead easy too. Shhh - until the CEPW KAL, it's our secret. Thursdays are for Knit Group – and a smart blogger would take her camera. Well, use her camera I should say. I remembered to take mine, but was so busy doing the happy dance because I was back at Knit Group on a Thursday afternoon, that I forgot to take any pictures. So today, you get just my knitting. 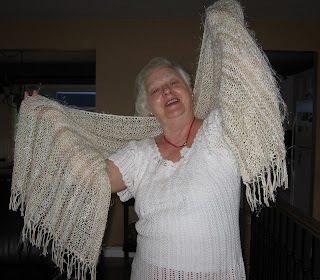 My shawl is finished. It has yet to be blocked, and the fringe needs a trim, but otherwise it is done. This is my Easy Peasy Wrap pattern. You can find in the post titled "What's Next?" under patterns in the list on the left. I used stuff from stash in shades of off white. A ‘beiger shade of pale’, to mimic the rock song. 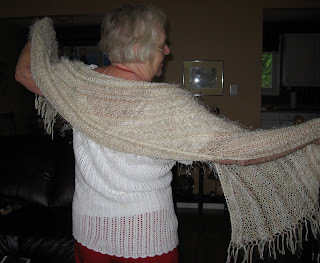 For this shawl, I cast on about 130 stitches. Sorry, that number is close, but I can't remember the exact number. 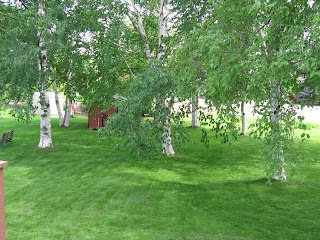 My memory is awash in those rainy days at the trailer. 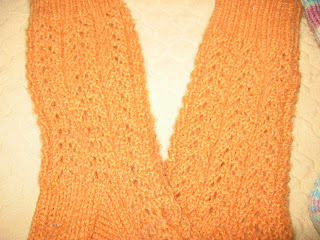 I knit every row using an 8 mm needle. 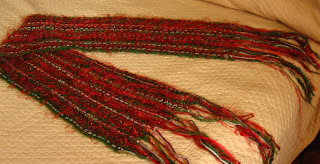 The large needle gives the wrap an open lacey look without the bother of lace knitting. Not that lace knitting is a bother, but this is faster. I kept throwing the wrap on my back and when I was happy with the depth, I cast off. One little tip – since an elastic cast-off row is very important in this wrap, in the row before the cast off row, I increased one stitch every ten stitches. That gave me 10% (Aren’t I smart?) more stitches for my cast off row. Enough to make it nice and loose. 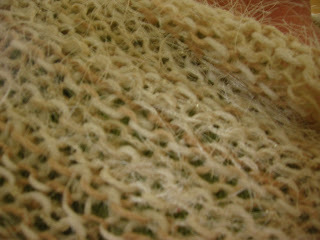 A close up to show the Eyelash’ yarn. Now, if I can just convince Fred to take me someplace where I will be wearing a little sun dress and then get cooler in the evening, I can ever so casually throw the gorgeous wrap across my shoulders. To 'oohs and aahs', I'm sure. The past two nights I have slept in my own bed. It feels great. All of this makes me sound as if I'm not a good Canadian. It's not as if the weather at home was great while we were away. The neighbours tell us we had lots of rain and cool temperatures here too. But let me tell you. A few days of rain in your home - that's one thing. But days of rain in a trailer - a completely different thing. So, it's good to be home. 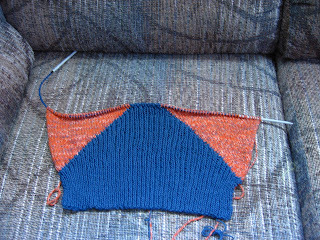 Monday, for the drive home, I had intended to wear the orange and blue top I knit. The goal, then, was to have the top finished by Monday. Well, Sunday. Do you recall last week's post that mentioned lengthening the top? And how I said I was lengthening the orange section, not the blue? And remember I commented on how lengthening the blue section was changing the look of the top? And how, strong as I was in knitterly denial, I decided to carry on? Big Mistake! With what remained of a thinking brain, I was smart enough to pin the front and back sections together, before sewing, to check on fit. Oh, what a fright! What showed in the magazine photo as a chic, cropped, summer top was now lengthened to a frumpy and dumpy blob. The blue point, meant to be just below the bust, had sunk to near my navel. That put the great expanse of blue ribbing over my belly. The blue section looked like an arrowhead - one badly off target. So - I sighed and ripped it. Then immediately cast on for a re-do. There was, after all, still time to ge it finished for Monday's drive. But I hadn't knit much when I realized the fun had faded. Deadlines do that sometimes. An orange time-out was called. 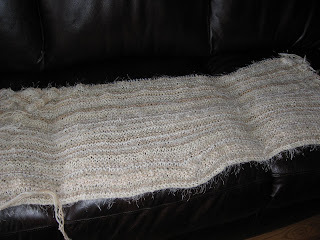 Since then I have been knitting this. A summer wrap. Knit with stuff from stash. Not travel attire, just good travel knitting. Saturday June 14 was National Knit In Public Day. Son Charlie, when told this knitterly news, guffawed. Muggle! Hubby Fred, countered with the news that the previous day was National Clean Out Your Refrigerator Day. That left me speechless. My concern was how to celebrate at the trailer park. Sole knitter, me, as far as I know. Not being at home, I couldn't participate in activities my knit group might have planned. Not being in Toronto, I couldn't participate in Stephanie's photo-op at Lettuce Knit. Instead, I celebrated in a very uniquely Canadian way. 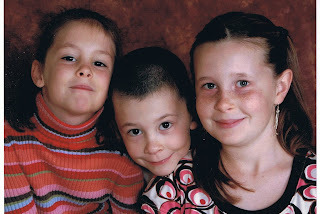 The Grand kids - they didn't guffaww at all, by the way - and I went to the most public place I could think of here at the trailer park - the bar. The kids slurped Slushies; I drank a beer and knit. And if there are any other Canadian knitter that celebrated with their Grand kids in a bar with stuffed wild animals on the wall, I'd like to hear your story. Photos taken at the bar, Veilleux Camping on Lake Pivibiska near Hearst, Ontario by Sarah, 11 and Abi, 6. Here are three of my most favourite Fathers. Well, they are not all MY Fathers. But they are Fathers all. 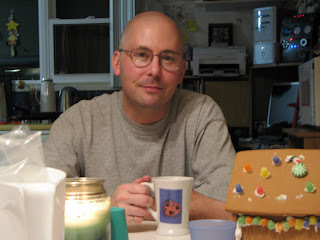 Son # 1 - the Father of the three beauteous grandkids. Wonderful men, all three. Happy Fathers' Day Dad, Fred and Charlie. About five years ago - or maybe a little more - I purchased a set of Denise Interchangeable needles. About to go on vacation, I was sold on the fact that I would no longer have to search out the Stedmans in little northern towns to find the size of needle that I thought I had packed. For all of the years since, I have used them exclusively. No other needle has touched my hands. Until recently. I love the Denise needles. Plastic tips - they make no noise and are easy on the hands. Their great 'poke & twist' joining system makes changing tips so easy. And they simply don't come apart unless you 'twist & unpoke'. Then there are the joiners. Never will you be stuck without the correct cable length. Just keep joining cables together. Need to put work on hold? Just remove the tip and add a button. A great system. But if there is one thing wrong with them, it is their universal cable size. It is quite thick. Not so much when using the lager size needles, but when using the threes and fours, it can mean a lot of reefing the yarn around. Then someone told me about Knit Pick Options Needles. I resisted for a long time. I had my beloved Denises after all. But finally, not wanting to be left out of something so current in the knitting world, I purchased a set of Knit Pick Options. WOW!! Slick. No problem with thick cables here. And those points. I've been known clean my teeth with them. After an evening of knitting, movies and popcorn, why take time to run for dental floss with those points at my finger tips. But they are slippery. Sometimes I find my hands cramping. I think I hold them differently, fearing the loss of stitches on those slippery needles. And I hate the little 'torq' thingy that one uses to fit the tip on to the cable. Within minutes of opening my kit, I lost one. Found it later, but for a few days, I worried every time a visitor sat on the chesterfield. And by the photos, you can see, I have had to make my own kit. With labeled pockets for the tips. Not nearly so slick as the Denise kit, but it will do. My perfect set of needles would combine the best of both sets. Plastic needle tips, marked for size, with a "poke & twist' changing system. Thin cables with joiners for those extra big projects. And don't forget the Readers' Digest sized storage system. Now, that would be perfection. This year, I have put my foot down. 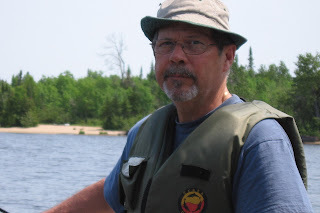 I tell people that in 42 years of married life, Fred and I have never had a vacation that didn't involve fishing. He reminds me of our recent trip to BC. So, OK. I lied. In 42 years of married life we have almost never, is what I should have said. This year, I have requested that on Wednesdays, we wander. Go places. See something that isn't fish related. Last Wednesday, we were lucky as the trip presented itself to us. Look what we saw. The Snowbirds - yes those famous Canadian pilots - came to Kapuskasing. Just an hour away. We picked up the grandkids from school and headed over. Charlie joined us after work. The show was outstanding! Ever so noisy. Ever so scary, as they performed stunts that made them appear to come close to crashing into each other. On the ground they look so tiny. But man, can they fly. And of course there was stuff for kids..
That's James about to take off' in this 'whirly kig' that turns you upside down, over and around. Real puke potential. It was meant to show the kids what the pilots go through in the air. And of course there were toy airplanes. James and a close up of his plane, with Abi in the background. And before the Snowbirds performed, a lone pilot from Alberta, using this plane, strutted his stuff. Unbelievable how they do it. For a finale, he flew at about 20 feet off the ground, upside down, through a ribbon held by four local dignitaries. Very scared local dignitaries I would imagine. I wonder where we will wander this Wednesday. It will be hard to beat the Snowbirds. Are you wondering if I knit at the trailer? Need you ask? This trip I only brought three projects with me. The first - the one I started during the ten hour car trip - is this little summer top. With these yarns, purchased in Nanaimo. 100% Cotton. When you shop far from home, you sometimes make a few mistakes. These yarns have the same label. The orange , a favourite colour of mine, caught my eye first. The gauge is 18 sts/4 inches. Just one stitch off required gauge. I can work with that. Without checking the blue - same label as yoou can see (well, at least same front part of the band) - I bought enough for the top. 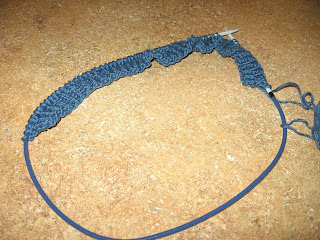 Ready to start the top, a closer look at the ball band of the blue yarn showed a gauge of 22 sts/4 inches. Dang! Before I started, I had to re-write the pattern for the lower portion. Knowing that once I arrived at the orange portion, I would have to change back again. 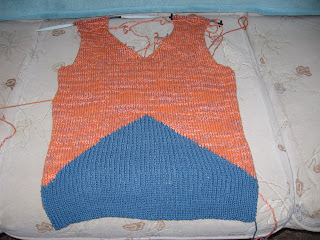 Not normally too difficult a task, but this top has several rows where both colours are used. And once into two colours, the orange uses two separate balls. 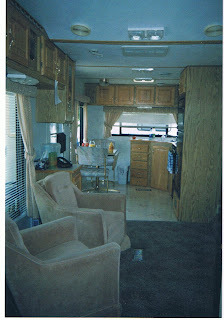 So, there I was, cramped into the front seat of the van along with all our stuff for a summer at the trailer, trying to knit from three balls of yarn using two different gauges, three sets of needles, two of which were a different size than the third. Just a tad confusing. And doing it in the car no less! But so far, it looks good. The top, as you can see from the magazine picture, is a short little cropper. But the magazine is quite old. With today's pant styles being lower waisted, I decided to lengthen the top. No exposed belly button for this Grandma. And I decided to lengthen the orange part as I like orange better than blue. Makes sense, right? More of the colour I like? But it has given the top a entirely different look. The point of the bottom portion in the magazine photo is nearer the top. Who would have known that was an important feature? Mine looks quite different. 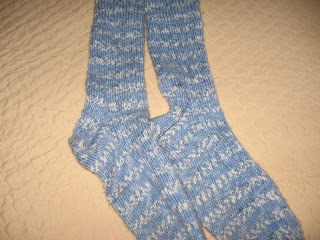 But with great knitterly denial, I am pushing on. I'm sure it will be fine. Otherwise it will be a re-start. And since today - while you folks in Southern Ontario are basking in warm temperatures - it is 4' and raining, I have lots of time to trailer knit.
" You been wearing one for all these years and you're telling me you don't know what size you take?" We-l-l, yea. That's it exactly. Our bodies have changed. Bones have bent. Weight's been gained. Estrogen's been lost. Little wonder we're obsessed about sizing. This past winter, my obsession took me to one of those trendy little bra boutiques. The type of shop I never feel confrotable in - ever! My 'age & stage' of live confirm that I can shop there, but my brain, stuck in the frugality of early-married years, keeps stammering "Stedmans! Stedmans!" This particular day, though, the experience was quite pleasant. The clerk, showing great empathy, commiserated with my 'bra-fit' concerns. A couple of hours of gentile bra-fitting later and she was placing my new $46 bra in the cutest little bag. FORTY SIX DOLLARS! I had never spent so much on a bra in my life. But good bra fit, I was learning, does not come cheap. A few days later, over coffee, an equally-obsessed friend and I exchanged bra-fitting stories. Her obsession had taken her to a mastectomy boutique. Still fully-endowed, her reasons for bra shopping at a mastectomy boutique were - well, really too complicated to explain. 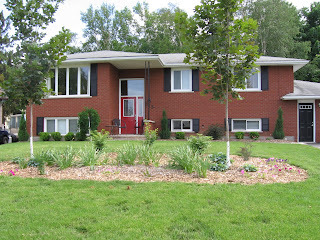 She was impressed with the knowledgeable staff who provided her with undivided attention. But the price! There was no cute bag and still her bra cost her $142. Holy hooters, batman! Can you say 'lift and separate'? Your money from your wallet that is. Shocked, I wheezed " Well, do you like the bra?" No, she said. "It's course and uncomfortable. Do you like yours?" "No" I replied. It feels like a suit of armour." $188 for bras and what we had was course, uncomfortable, board-like bras. When did the advertising executives decide to pick on the over- sixty crowd? My next bra, was a WalMart special. $6.96. 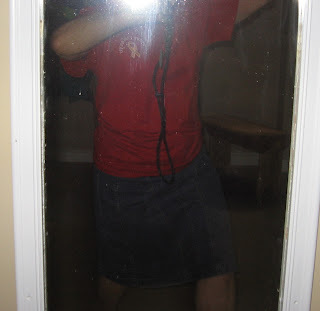 And I didn't even try it on. And guess what? It fits just fine. 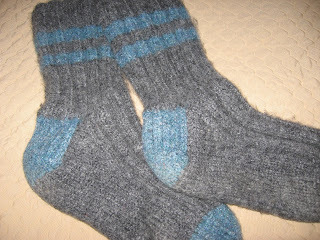 You might remember that when I made the Opal &Mohair socks, I used a provisional cast-on for the second sock. There are many ways to do a provisional cast-on. Sally Melville speaks often of the 'Crochet Cast-On' for provisional work. Elizabeth Zimmermann had a method of 'flip-flopping' the hands to do a figure-eight provisional cast on.
" What is the point of a provisional cast-on?" It is to have live stitches available to be picked up and knit in the opposite direction at a future point in the knitting. Hmmmm How could I do that easily? 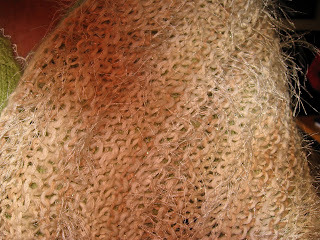 Then, remembering that knitting unravels easily in the direction opposite to which it was knit, I had a brain wave. 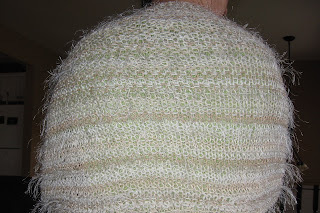 1) Cast on for your project in waste yarn. Anything will do, but you will have better luck if you choose yarn about the same gauge as your project. 2) Work a row or two. I say 'or two' for no reason other than it is often easier to do things in knitting if you have something to hold on to. 3) Work one row using this. "What is that?" you say. 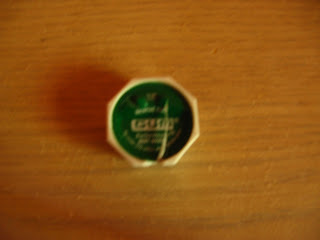 Dental Floss. Dental floss is slippery. It will pull out easily. 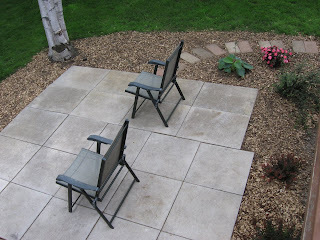 4) Complete your project. When you are done knitting, simply pull out the dental floss. Off will drop the waste yarn, and Voila! Live stitches to be picked up. 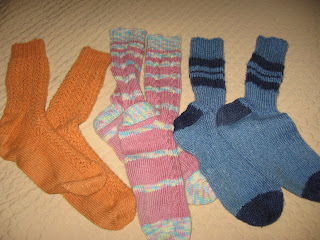 Some knitters wax poetic about soft sock yarn. Ooooh so sooooft. Ooooh so cushy. They use words like comfy, squishy, heavenly, fluffy. Phrases such as marshmallow-soft, cloud-like. But me? I like my socks tough. I favour yarns like Regia or the almost-defunct Kroy. 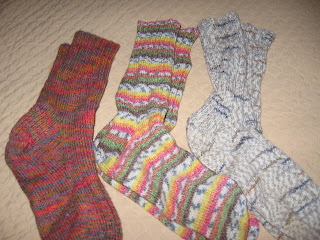 I have yet to make a pair of socks without some nylon in the yarn. I like them tough because they stand up to washing and wearing for years. 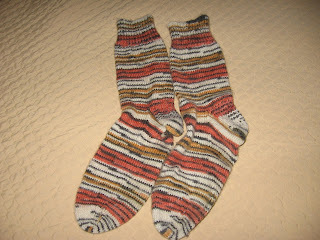 Here is my very first pair of socks. Regia yarn. Still going strong after 7 years. 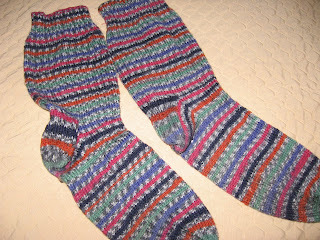 And I have lots of socks made with the colourful Kroy - now discontinued. That lace deserves a close-up. I have cotton socks for the warmer weather. But still with nylon. Roughly 37% cotton, 37% wool and 25% nylon. 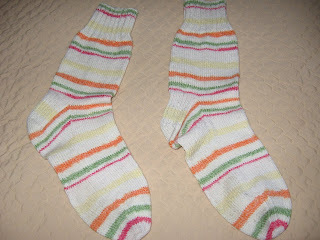 I made a pair of Opal socks once. But it is not my favourite yarn. Too soft. Elann has a good sock yarn. 75% wool 25% nylon. Tough. But the toughest yarn has to be the yarn these socks are made of. Why do I say that? Doing the laundry last week, I sorted the clothes into darks, lights and whites. Everything at my house gets washed in cold water except the whites. For them, I use hot water. And lately because some of my whites are starting to look a bit 'off' I have been putting in a bit of bleach. These socks went into the 'lights', wash-in-cold-water, pile. Well, one of them did. The other sock ended up in the 'whites' pile Washed in hot water and bleach. Dried in the dryer. Can you tell which sock was tortured? Neither can I. Regia. With wool, cotton and nylon. Tough!